If you got hit by Google during its recent pagerank update because your blog is doing sponsored posts, chances are, you probably don’t get as much opportunities while doing your sponsored reviews. 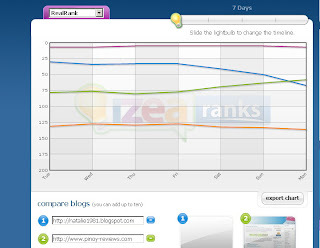 ©2008 natalie1981.blogspot.com IZEA has just launched Izearanks.com, a system that calculates how your Blog Ranks compared with other blogs based on average daily traffic. Though Izearanks purpose is noble (we all want to have an accurate and unbiased ranking system), it is still in the early stage and it needs to work out some kinks in their system and assure their members that their system is not vulnerable to fraud (generating thousands of traffic through autosurf sites is very easy), with that said, it’s still nice to compare blog rankings and have some sort of bragging rights over the other blogs, plus you can get a chance to win an easy $1000 for having a #1 RealRank.